9V battery eliminator for the Mini SSC II serial servo controller board from Scott Edwards Electronics. 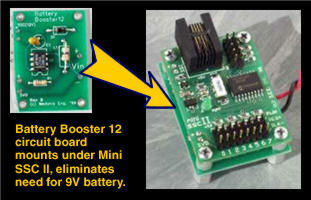 The Mini SSC II normally requires both a 9 volt battery and a separate servo battery pack. Install a Battery Booster 12, and it boosts the servo battery pack voltage up to 12 volts to run the microprocessor circuit on the Mini SSC II. Mounts underneath the Mini SSC II using included hardware. More about the Mini SSC II is here.